I'm fascinated by a book I picked up at the library yesterday. It's called Afterthought: The Computer Challenge to Human Intelligence. It was written by James Bailey, a former exec at Thinking Machines Corp., way back in 1996. Here's his thesis: We're entering the third age of maths (as he called them). Each is a product of the technologies and media available, and each changes the way we think. In the first age, the Greeks were trying to figure out the location of themselves in the world and the universe. They focused on "Where," and developed geometry to handle the job. With the scientific revolution, and the development of mechanical clocks, the focus turned to movement: speed, velocity, pace. And for this, Newton and others developed calculus. Bailey makes the point that the technology we have at hand greatly influences the types of calculations we do. In ancient time, for example, the Greeks drew their geometical designs on papyrus. To their east, Babylonians were also carrying out sophisticated astronomical calculations. 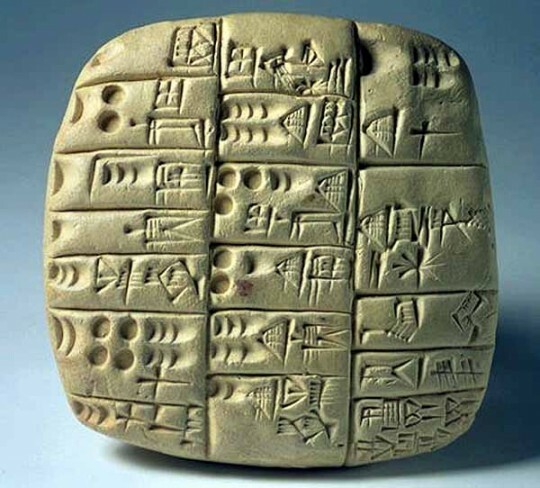 But their cuneiform tablets (above) didn't lend themselves to arcs and tangents. (Try drawing a good circle in clay) So they used a number-based system, which led to algebra. Through the Middle Ages, Europeans kept at geometry, drawing their circles and triangles in hand-written books. But with the printing press, this became difficult. They switched to a numbers- and letters-based approach that could be laid out in movable type. With computers, Bailey writes, we're moving back into a medium built for graphical representations. And they'll communicate the evolving, morphing, teeming behavior of networks, contagions, automata--all them summoned by mankind's third generation of math. I only started reading the book yesterday. I might be posting more about it. Incidentally, I'm flying to Abu Dhabi on Sunday for three days at the Media Summit there.That's about 26 hours in airplanes, coming and going. I'll need some other books to take along, and am open to all suggestions.